The counties merged since the beginning of the 16th Century in the so-called Wetterau Association of Counts had already introduced the Reformation into their counties early on, e.g. William I in the County of Wittgenstein from 1534 and William The Rich from 1533 in the County of Nassau-Siegen-Dillenburg. On the basis of various contacts the counts had in the Electoral Palatinate and the Swiss Confederation, but especially in the Netherlands, the attitudes of the counts from after 1566 tended gradually towards the Reformed confession. First and foremost among these was Count John VI of Nassau-Katzenelnbogen. In 1576 the previous Wittenberg Professor Christoph Pezel had become the preacher in Dillenburg, and in 1577 Count John officially professed his allegiance to the Reformed confession. And already by 1578, a “Nassau Confession” drawn up by Christoph Pezel was adopted. Although there was clear mistrust of the introduction of the Reformed confession among the people, there was at the same time no coercion on the part of the count. 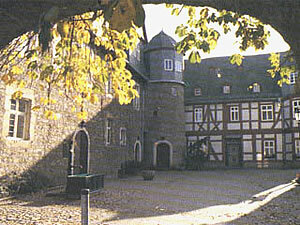 In 1584 Count John VI founded the high school in Herborn, which gained a reputation stretching far beyond the county, among other things, owing to the professor of law Johannes Althusius, and became a model for other high schools (e.g. the one in Steinfurt). The transition to the Reformed confession also gradually progressed in Wittgenstein from 1565 on and gained a somewhat greater dynamic when the previous Heidelberg theologian, Kaspar Olevian, became court chaplain in Berleburg in 1576 (and from 1584 professor in Herborn). In 1586 a Reformed general synod of the counties Nassau-Siegen-Dillenburg, Wittegenstein, Solms and Wied met in Herborn and a new church constitution was passed (on the model of the Church Constitution of Middelburg of 1581). Two things stand out. First, a characteristic of this church constitution is to combine the presbyterial-synodal constitution, according to which the church is constructed from below (concretely, from the congregation), with the regional rulers’ church rule, which portrays a church from above, combining them in such a way that the presbyterial-synodal element predominates. Second, it unites the churches in the county to form a church embracing all regions. It is striking that the counts accepted this constitution. The attempt of a re-Catholicisation of the Part-County of Nassau-Siegen (in 1626, after the death of John VI, the county was divided up) ultimately failed. The Reformed congregations belong today either to the “Protestant Church in Westphalia” or to the “Protestant Church of Hesse and Nassau.” Some of the congregations have remained Reformed while others have merged with Lutheran congregations to form united congregations. At the general synod of Herborn of 1586 the constitution drawn up by Caspar Olevian was passed. In all these the affairs of the church are to be brought to discussion and that which is brought up should be dealt with according to church procedure. Only what could not be resolved in the smaller assemblies should be dealt with in the larger assemblies, or what relates to the whole church or several churches. The constitution originating in 1586 and going back to a Dutch model displays the typical presbyterial-synodal church structure for many Reformed congregations in Germany. 1. What role do the “rulers” (Herren) i.e. the regional rulers play for the life of the church? 2. What does it mean if the general synod can meet in various counties? 3. What is the relationship like between the smaller and larger assemblies?